For a quick and easy grab-and-go breakfast, this Peanut Butter and Jelly Chia Seed Pudding has gotta be in your recipe arsenal. Better yet, it’s got no sugar added, it’s high in fiber and protein, and it also happens to be gluten free and vegan too! No need for the white bread, peanut butter made with hydrogenated oils, or corn syrup-infused jelly. This healthy Peanut Butter and Jelly Chia Seed Pudding has ALL the PB&J flavor, requires only FIVE ingredients, and is sugar free, gluten free, and vegan! In a large bowl, add the almond milk and peanut flour. Whisk until completely smooth. Add the stevia extract, chia seeds, and salt. Whisk until completely mixed in. In a small blender (I used my NutriBullet), add the thawed blueberries. Puree until completely smooth. Cover both the chia seed mixture and the blueberry mixture and refrigerate overnight. 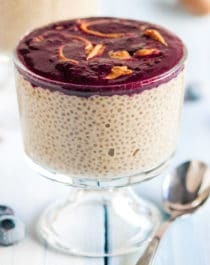 The next day, scoop the chia seed pudding into serving jars and spoon the blueberry mixture on top. Enjoy! Awwwww yeahhhhh! Now THAT’S a healthy breakfast, lemme tell ya! This Peanut Butter and Jelly Chia Seed Pudding will fuel your day the right way. It’s packed with 12g of protein, 10g of filling fiber, and 7g of healthy fats. Most importantly, it’s damn delicious. BOOM! What a fun personal breakfast, snack, or dessert! My kids will love these! Can I sub coconut milk? Thanks! Looks great! How many servings in a recipe?